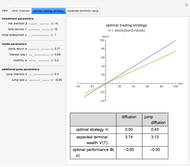 This Demonstration shows the optimal solution to the problem of maximizing the expected utility from terminal wealth. You can choose between power utility and logarithmic utility. It is assumed that there are only two assets in the market, a riskless bond and a stock that follows a geometric Brownian motion (Black–Scholes model). Additionally, you can choose to introduce simple jumps to the stock model. The jumps are given by a compound Poisson process. The first graph shows the utility function used. The initial utility is logarithmic. 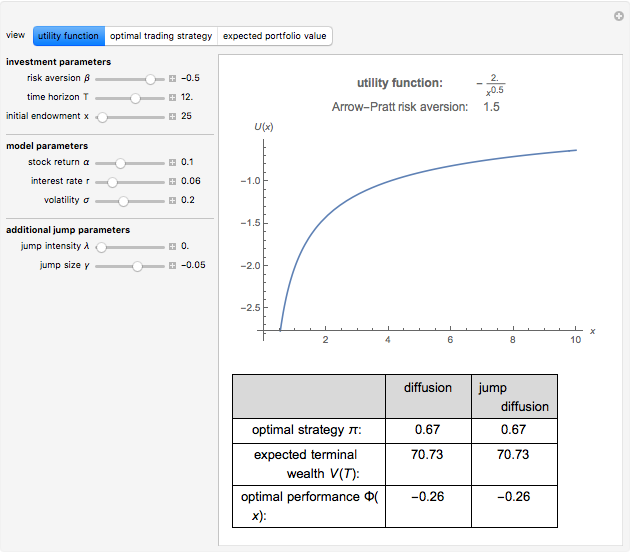 You can change the utility function using the risk aversion parameter . The value represents log utility and represents a power utility function of the form . The Arrow–Pratt index of risk aversion is defined by . In the case of a power or log utility, this parameter is equal to . The table shows the numerical results of the portfolio selection problem. The optimal strategy is defined as the proportion of wealth held in the stock, meaning the amount of money invested in the stock divided by the total amount of wealth. A value greater than one means that the optimal portfolio is a leveraged portfolio for which money from the bank is borrowed (bond is short sold) and invested in the stock. A negative value means that the stock is sold short and the money is invested in the bond. The expected terminal wealth shows the expected wealth at the end of the investment horizon . 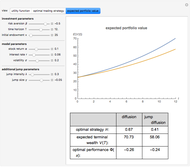 The optimal performance function (also know as the optimal value function) is the maximum expected utility from terminal wealth starting with an initial endowment . 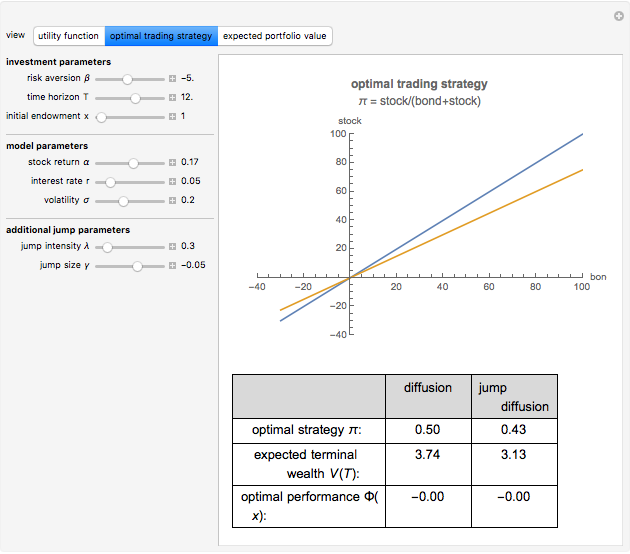 The optimal trading strategy graph shows the proportion of wealth that should be invested in the stock and the bond, respectively. The amount of money invested in the stock as function of the amount of money invested in the bond can be written as stock = bond. The blue graph represents the optimal trading strategy in the case of a Black–Scholes type model. The purple graph represents the optimal strategy under the assumption that the risky asset is governed by a jump diffusion. You can control the size and intensity of the jumps. 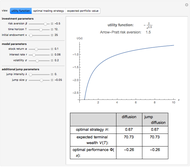 Finally, the expected portfolio value graph plots the expected wealth process with respect to time . Again the blue graph represents the diffusion case whereas the purple graph represents the jump diffusion case. Daniel Michelbrink "Terminal Wealth Optimization with Power and Log Utility"